The major uniqueness of the Ellora caves is the three different types of caves i.e. Hindu caves, Buddhist caves and Jain caves. Hindu caves are located on the left of the Kailash Temple i.e. in cave numbers 13th to 29. These caves are decorated with unique carved pictures of Hindu Gods & Goddesses and with columns. Some caves are really big with more than two or three floors. On the other hand, Buddhist caves look very elegant with fine carvings. They are on the right side of the Kailash Temple i.e. in cave number 1 to 12. 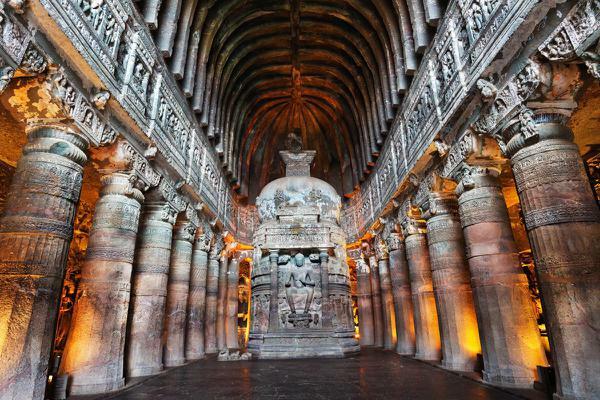 These caves are beautifully decorated with amazing Buddhist sculptures and stone artwork. The timing to view the caves is between 6:00 A.M. to 5:30 P.M. and closed on Tuesdays. So whenever you plan your trip, plan it accordingly. Talking about the third cave i.e. the Jain Caves are in cave number 30 to 39. Similar to the Hindu and Buddhist caves, Jain caves are also decorated very beautifully. Golden Immigration, India’s renowned name among the best Immigration Consultants in Delhi, is the best place to get all the solutions for your Australia Immigration related problems. Why are you waiting now? Just pick up your phone to book your taxi from Faridabad to explore the amazing and most fascinating caves in Aurangabad district of Maharashtra state of India.